The color red is nature's attention getter, the exact shade of pay-attention-to-me. Whether it's intended as a warning or an enticement, a red hue catches the eye like no other. Rubicon drivers know all about spotting danger and getting attention. They chose their Jeep specifically because it was tough enough to reach those challenging, threatening places - and because the Rubicon's rugged, strong look is unparalleled. 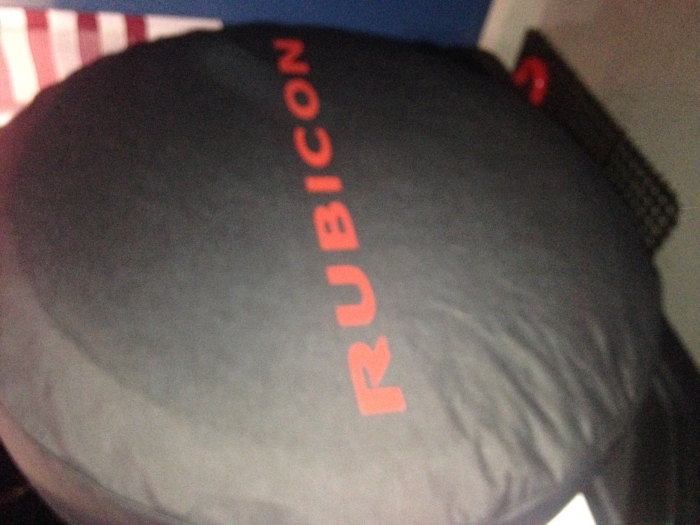 Add a bit of red with our Rubicon tire cover. Made out of black denim, the cover features a sturdy, tight-fitting construction that will protect your spare from all sorts of danger. It features the Rubicon logo typeset in a bold red color, adding a sporty, strong look to your rear tire. The cover is made by OEM Mopar, so it matches your Jeep's existing logos perfectly, giving you a fresh-from-the-showroom look. At Just for Jeeps, we work directly with Mopar to offer customers deep discounts that stop dealers like red traffic lights. Our red Rubicon tire cover is an eye-catching upgrade for your Jeep. Very good quality. Looks and fits great! Great seller! Good cover, nice quality and fits my tire very well.. I think it is a little pricey. I also wish that the red Rubicon letters were embroidered, not silk screened. ProsFits the tire very well. Clean look... really complements Rubicon! Simple, clean look... that really complements my new Rubicon. I recently bought a 2014 Jeep Wrangler Rubicon X and wanted a spare tire cover to match my vehicle. This cover looks great!! It was easy to install and fits over the spare tire perfectly. The canvas cover is very strong. The canvas seems to be layered with a protective coating to prevent fading too. The red Rubicon lettering is the perfect detail for the rear view of my Jeep. I would recommend this product to anyone! I was a little skeptical about the material but it seems very sturdy. The cover fits perfectly and looks great. My hubby loves it.